Last Friday, a monster stole the lives of 20 innocent young children and 6 staff members that loved them at Sandy Hook Elementary School, along with the life of his own mother. Like the rest of the world, I watched the events unfold in horror, and like many of you, I still can't come to terms with the magnitude of this tragedy. I feel so much sorrow at the loss of all of those young children, and I am truly touched by the incredible stories of the teachers and staff who risked or lost their life trying to protect their students. It is hard to move on with this blog this week as if nothing has changed in me, because it has. When I became a parent, every cruel and violent act towards a child now affects me in ways I never expected. Yes, I'd read news stories and be sad, but it was easier to put them out of my mind. This event has left me horrified beyond words, and I just cannot stop thinking about it. Tomorrow, there will be a moment of silence at 9:30 AM for the victims of this tragedy. It is hard to have a moment of silence on a blog, so I would instead like my blog to be silent for the day. I am releasing this week's freebie early. 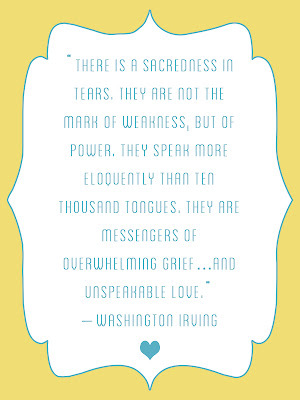 This is a 3x4 printable card featuring a quote that touched me in relation to this event. We are all grieving and mourning in our own way, and for those of you that might wish to record your thoughts in your albums, I thought this might be of use. I myself added my thoughts to the back of my journaling card for the 14th. The victims of Sandy Hook, the children whose lives ended much too soon and the teachers and staff that lost or risked their lives to save them, remain in my thoughts.